People stand in our way at the kitchen counter and leave toothpaste in the bathroom sink. Mired in the muggy heat of July, we mess up each other’s routines and call one another at inconvenient moments. And yet, the truth is that we need each other. We need the jolt that sends us careening out of the center of the universe and into another soul’s perspective. Chances are if you live in the crucible of ministry, you’ve given some thought to your soul-ish self, and maybe you’ve even felt the danger of losing touch with your real self in the course of a day’s work. This is more than just an academic concern, for the spiritual leader leads from the soul, but it’s easy to lose track of one’s own soul in the care and feeding of the souls of others. Ruth Haley Barton felt the insidious slippage in her own ministry and gathered lessons from the life of Moses as a lifeline back to herself and a vibrant relationship with God. In July, I reviewed the results of her gleanings which have been re-released in the expanded edition of Strengthening the Soul of Your Leadership: Seeking God in the Crucible of Ministry (Transforming Resources). Each chapter of Just Open the Door unpacks a different facet of the hospitable life with words of encouragement and stories lifted from Jen Schmidt’s own parenting, inviting, tail-gating, pot-lucking life. For every “have to” moment in your day, Jen invites you to switch the sentiment to “get to,” as in “Today, I get to change the sheets in the guest room.” A life marked by gratitude opens up the floodgates to all kinds of hospitality. You can read more here. G.K. Chesterton and his wife Frances did not have children, but even so, I found plenty of wisdom to apply to my own parenting life as I pressed into Chapter 7 of Orthodoxy this month. Every decision that we make in the run of our ordinary days has roots in something deeper, or, as Chesterton put it, “There must be something eternal if there is to be anything sudden.” (165) May we find grace to lean into the practical impact of our theological underpinnings even in the day-to-day decisions that govern the way our home functions and they way we shepherd our children’s hearts toward orthodoxy. Packing up the lesson visuals and the juice, the song flash cards and the c.d. 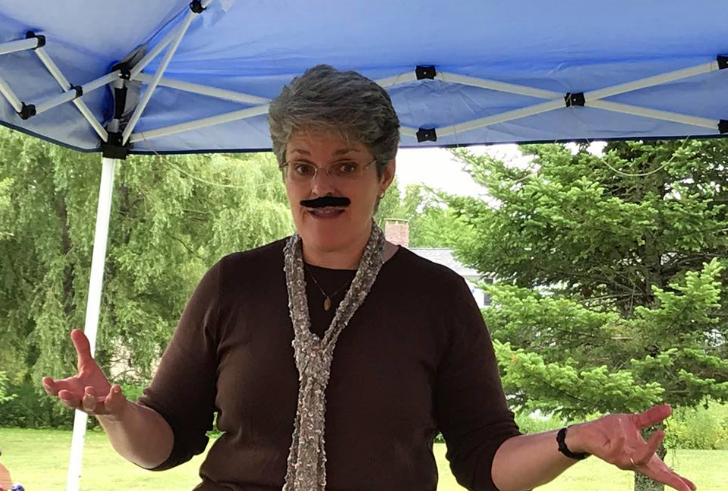 player, the prizes and the fake mustaches for our church’s summer children’s outreach, it occurred to me that I can teach a room full of women for at least 45 minutes with nothing but a Bible and my notes. Children’s ministry is exhausting. Truly. You need all the dogs and all the ponies, and a lot more charisma than lives in this 55-year-old carcass. But then, God the Holy Spirit is a force to be reckoned with, and so I’m grateful for five days of living the blessing of being a vessel, holding the Truth and pouring it out for our own church kids and for a few who just don’t get it anywhere else. These great teen leaders were a joyful part of the experience, and my prayer for them is that God would continue the great work He has begin in their lives. The green rows of growing things draw me like a magnet this time of year. The work inside suffers from neglect, but it will wait, and as hot and dirty as I get out in the garden, it never seems like work to me. Already we are enjoying salads of fresh-picked greens, and there are a dozen jars of dilly beans on my basement shelves. This month, I wrote a piece inspired by the quotidian task of piling rocks into a rusty wheelbarrow and the harvest of blessing that comes from simply showing up to gather stones. We were new in church and new to the area, and our little three-bedroom fixer-upper was situated in a part of the universe in which it didn’t matter that we had been born and bred in Maine. We had not been born and bred in this part of Maine, and we had the accent (or lack of same) to prove it. We knew we had some work to do if we were ever going to live our way into the homes and hearts of people in Mid-coast Maine. We also knew the answer was, of course, to go first — to begin inviting people for Sunday dinner or Saturday night dessert and a movie. But here’s the catch: four babies in eight years makes for a complicated math that drains the budget and strains all available time and energy for home improvement projects. As the years passed, the fixer-upper still looked pretty un-fixed as we replaced the furnace and shingled the roof, bought sneakers and paid for home school curriculum. Somehow, though, we knew that this was not the time to put life on hold. In a deliberate act of hospitality, we set a goal of inviting one new couple each month for Friday night supper. We opened our door, inviting guests into our own unique chaos of high chairs and sheet rock, half-painted woodwork and ugly kitchen cabinets. This was our way of opening up our life and inviting others to open theirs to us. Each chapter of Just Open the Door unpacks a different facet of the hospitable life with words of encouragement and stories lifted from Jen Schmidt’s own parenting, inviting, tail-gating, pot-lucking life. For every “have to” moment in your day, Jen invites you to switch the sentiment to “get to,” as in “Today, I get to change the sheets in the guest room.” A life marked by gratitude opens up the floodgates to all kinds of hospitality. Simple refreshments and a warm welcome transform any space into hospitality ground-zero. At the end of each chapter, Schmidt shares tips that “Elevate the Ordinary,” because intentionally loving others transforms paper plates and styrofoam coffee cups into fine china. Be a gatherer of people, and you will not lack opportunities to love your neighbor. Even if you are not “fine,” you need not be alone if there are people in your life with whom you are free to exchange the gift of your own imperfection (119) for the gift of their listening ear. The whole family can get in on the opportunity to neighbor broadly and indiscriminately in simple ways such as picking up the trash that lands along the streets or making conversation about dogs and kids. Our children have received great benefits from being included in multi-generational gatherings, and we have also loved hosting their friends. Everything from spontaneous gatherings around the fire pit for s’mores and firefly sightings to huge gatherings with lace tablecloths and the best dishes have been part of our family’s culture. Jen has spoken truth in her subtitle, “One Invitation Can Change a Generation.” These days the tables get turned sometimes as our married sons and their wives invite us to their homes to be blessed and fed and connected with family and friends. Things will not always go well. Events will not necessarily unfold according to plan. There will be seasons in which hospitality is just not possible, and you may need to be the object of someone else’s care and love. God has a way of showing up in unexpected ways, showering grace into a situation that looks hopeless. Throwing wide the door of welcome, we embody God’s welcome and put the Gospel’s warm, life-giving hospitality on display for a world of people whose life may be changed by one simple invitation from an open and responsive heart. 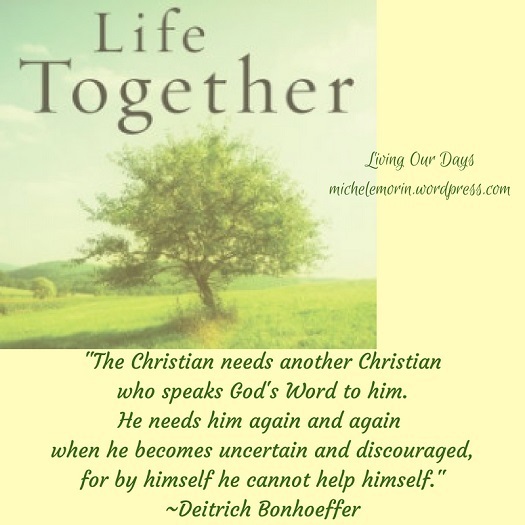 When we open the door, we mirror God’s acceptance, and I’m coming away from Jen Schmidt’s soft-spoken challenge with a renewed desire to lean into the risk, to open the door when I’m not quite prepared as an act of faith: “Lord, what are you about to do here?” Relaxing my need for control frees Him to work as table becomes altar, hostess becomes servant, and my open door becomes an invitation to New Life with Him. Many thanks to B&H Books for providing this book to facilitate my review, which, of course, is offered freely and with complete honesty. I am a participant in the Amazon Services LLC Associates Program, an affiliate advertising program designed to provide a means for sites to earn advertising fees by advertising and linking to Amazon.com. If you should decide to purchase Just Open the Door: How One Invitation Can Change a Generation , simply click on the title (or the image) here or within the text, and you’ll be taken directly to Amazon. If you decide to buy, I’ll make a small commission at no extra cost to you.